Welcome to day one of the 5th Annual Knitting and Crochet Blog Week, hosted by Eskimimimakes. I’m thrilled to be taking part and look forward to reading everyone’s posts. Describe a day in the life of a project that you have made, or are in the process of making. I’ve decided to chronicle a day in the life of my Norwegian stranded color work mittens–specifically, the day I cast them on. It all began at Yarnover 2014, where I was taking Fearless Two-Color Mittens with Mary Scott Huff. I went to class feeling completely clueless and awkward. I left class still clueless and awkward, but not about Norwegian stranded color work. This T-Rex is out there in the wilds of Ravelry, stalking for prey. It’s got a taste for color work now. By the way, for those of you who are unfamiliar with the original source of the art above, I want to let you in on the joke. The art is from Dinosaur Comics, a constrained web comic by Ryan North. The comic’s gimmick is that it every strip uses the same artwork; only the dialogue varies. A couple of years ago, Mr. North shared an unwritten comic panel online and invited fans to make their own Dinosaur Comics. You can too. Previous And the winner of the shawl giveaway is…. Whenever i’m having a bad day I imagine a t-rex trying to make a bed. Never fails to cheer me up. Dinosaur Comics add a touch of class to any blog post! The literal class sounds delightful too. Love this! It has been one looooong Monday and this just made me smile. Thank you. So cute and funny- I like the last dialog box the best haha. And yay for mitties! Hehe. Thanks. That’s my favorite box too. I’m tempted to try making more dinosaur comics. Love the dinosaurs, made me giggle! Good. That was the idea. 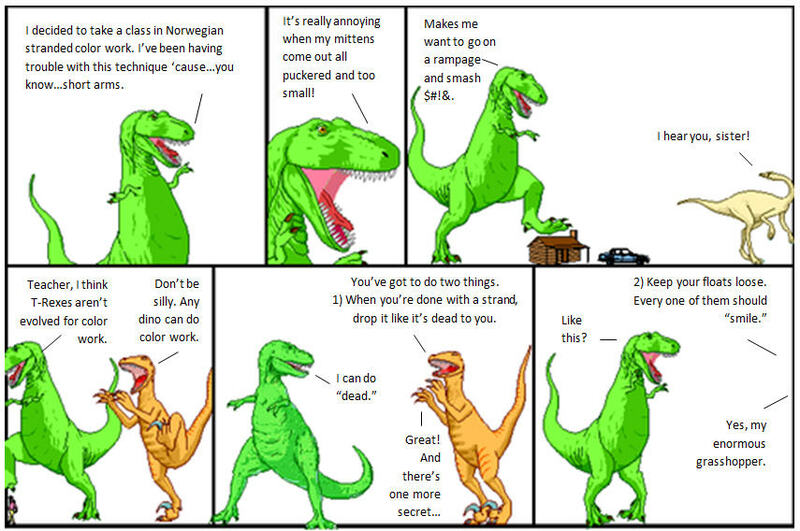 This is the best repurposing of Dinosaur Comics I’ve seen! Thanks. It just seemed to work. Holy Knitting Dinosaurs! I just found your post by accident – I have never laughed so hard in my life, May I please have permission to post it on my blog? I just love you!